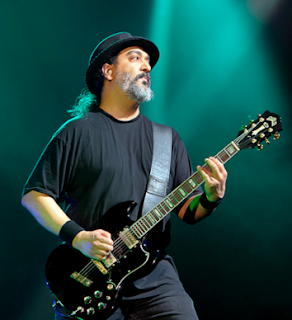 Kim Thayil of Soundgarden's main guitar is the Gibson SG-like Guild S-100. "I was 18 or so and bought it used in 1978 for about $200. But once I really started to play that first S-100, I realized how well it played with low action. The SG neck was thicker and the fretboard seemed wider, and my hands couldn’t really navigate that as easily as the S-100. I really like the stock Guild pickups—I have all the original Guild pickups in my S-100s—because they produce a hot, loud, rambunctious tone, which I love!" "Plus, the stock tuning pegs on the Guild S-100s are Grovers and they have the perfect ratio and really take a lot of force to get out of tune."